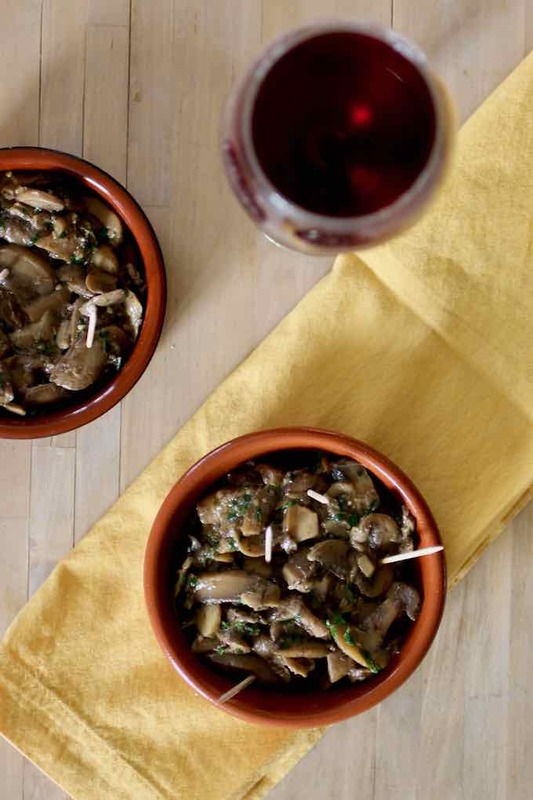 Setas al ajillo or champiñones al ajillo (mushrooms with garlic) is a favorite of tapas bars in Spain. 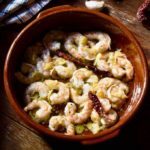 This tapa recipe is usually served hot in a clay pot in bars and restaurants in Madrid, as well as the rest of the country. It can also serve as an accompaniment to meat and fish. Setas al ajillo are also sometimes served on a toast. Tapas are small plates of food that originated in Spain. They are served between meals and are usually accompanied by alcohol. Tapas can also be combined to make a full meal. In several countries in Central America, similar snacks are known as bocas. In some parts of Mexico, they are called botanas. In Northern Spain, they are called pinchos or pintxos (in Basque) as those snacks have a pincho (toothpick) through them. The toothpick is not only used to keep the snack from falling off the slice of bread but also to keep track of the number of tapas the customer has consumed. 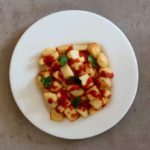 There is a wide variety of tapas, including cold such as boquerones en vinagre, olives or cheese, and hot such as tortilla, pulpo a la plancha or patatas bravas. The word “tapas” is derived from the Spanish (and Portuguese) verb tapar, which means “to cover”. What is the history of tapas? There are multiple stories and legends that explain the origin of tapas. According to one legend, King Alfonso X, The Wise King of Spain, once contracted a serious illness, which only allowed him to eat small portions of food along with small amounts of wine. Another popular story mentions that King Alfonso XIII stopped by a famous tavern in Cádiz (Andalusia). As he ordered a glass of wine, the waiter covered it with a slice of ham to protect the wine from the beach sand. After the king finished his glass and ham, he ordered another wine “with the cover”. Another story tells that a decree was issued by King Felipe III to prevent rowdy drunken behavior, particularly among soldiers and sailors, The law stated that the bartender was to place a cover or lid containing some small quantity of food on top of any alcoholic beverage. Other sources mention that tapas may have originated with farmers who consumed small meals accompanied by wine throughout the workday to give them energy between meals. Before the 19th century, tapas were served by posadas (hotels/inns), albergues (hostels), or bodegas (wine bars), that were offering meals and lodging to travelers. Since most people could not read at the time, the establishments offered their guests a sample of the dishes available that day, on a “tapa” (“pot cover” in Spanish). The original tapas were thin slices of bread or meat that were used by guests to cover their glasses between sips, to prevent fruit flies from hovering over or falling into the sweet sherry. The meat was usually ham or chorizo. Bartenders and restaurant owners started offering a variety of similar salty snacks to serve with sherry, in order to increase alcohol sales. Some sources mention that since most people would be standing while eating tapas in traditional Spanish bars, they would need to place their plates on top of their drinks in order to easily eat, therefore making it a top. Others believe the word originated around the 16th century when tavern owners from Castile-La Mancha realized that the strong taste and smell of mature cheeses could help disguise that of bad wine. They started offering free cheese when selling cheap wine to “cover” it. Other sources also claim that tapas originated in the south of Spain during the time of the Spanish Inquisition. They were used to publicly identify Jews who had converted to Christianity, as tapas often consisted of ham or other non-kosher products. 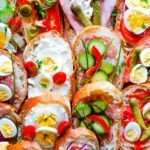 Tapas have evolved through Spanish history, whether it is with the invasion of the Romans, or with the discovery of the New World that brought new ingredients like tomatoes, potatoes, peppers or corn. 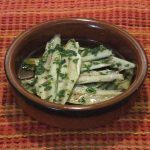 Setas al ajillo are very easy tapas to make. 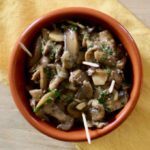 After sautéing the mushrooms, and making sure most of their moisture has evaporated, just mix them with the garlic and parsley. 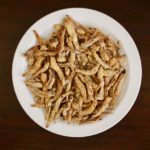 Optionally, you can spice them up with chili, whether fresh, or dry powder or flakes. Finish the dish with a splash of white wine for a great balanced aroma. 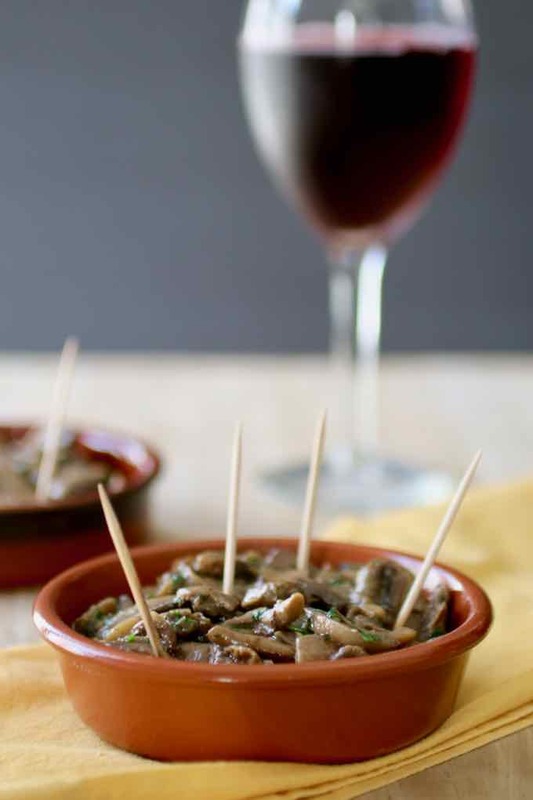 You can’t go wrong with this mushroom tapa. 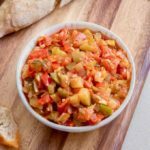 You can either serve it with sangria, tinto de verano, or just finish the bottle of white wine that you opened to make the dish! 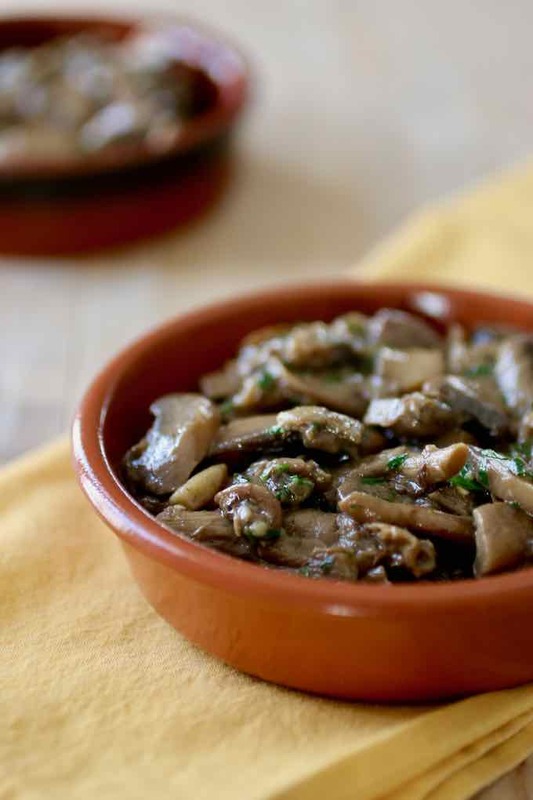 Setas al ajillo or champiñones al ajillo are a favorite Spanish tapas, prepared with mushrooms sautéed with garlic and white wine, and topped with parsley. Properly clean the mushrooms by removing any dirt. Then, dry them well with paper towel. In a non-stick frying pan on high heat, add olive oil. When the oil is hot, add the mushrooms and sauté until golden brown, about 8 to 10 minutes. Make sure the oil is very hot so they release their water quickly. Reduce the heat to medium and add the garlic, parsley and hot pepper (optional). Cook for a couple minutes. Finish with a splash of wine. Let evaporate most of it and remove from the heat. Sprinkle with a little more parsley and season with salt and pepper to taste.